Hey y'all! Hope you are having a good Saturday! 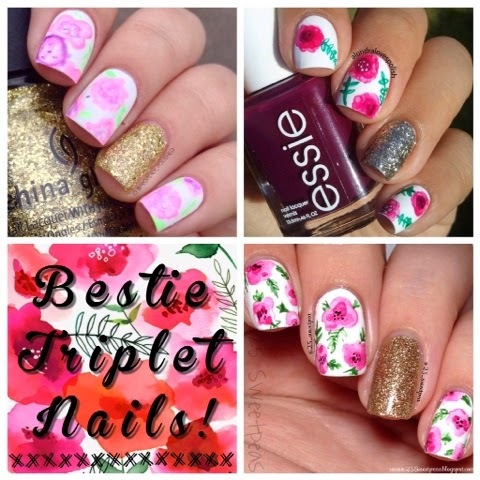 Today for ya I have my first ever Bestie Triplet Nails with some of my IG friends! I have done mani swaps with both of these lovely girls before and it's always fun! So since we had all done things together before in twos I decided to ask them if they'd want to do a group mani, and we planned from there! Thanks so much Properly_Polished and AlondraLovesPolish for working with me! Glad we finally got a chance to get them done! First off I will show you mine, and all that good stuff then I will show you out collab photo! Honestly these were so fun to do!! I haven't ever really done a "water color" floral so it was a first and I really liked doing it! For this look I used Sinful Colors Snow Me White as my white base. Then for the gold accent finger I layered Venique Boat Shoe Castaway and China Glaze Champange Kisses. 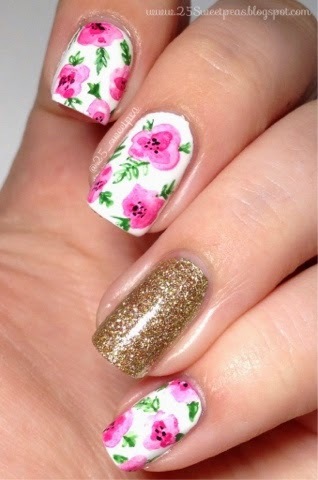 The flowers were done with a watered down dark pink acrylic paint. I did it a couple times in some places to make a the color contrast a but more intense. Then the flower leaves were done with a mixture of green acrylic paints. I love doing nails with small details like this! Also I am liking this water color method, just because it doesn't have to be perfect and it looks nice! I think that it just neat and makes each mani unique! Ok now for our collab photo! Here they are! I love them all, I think they all turned out wonderfully! The bottom left square is what inspired this mani, it's a picture I found on Pinterest. 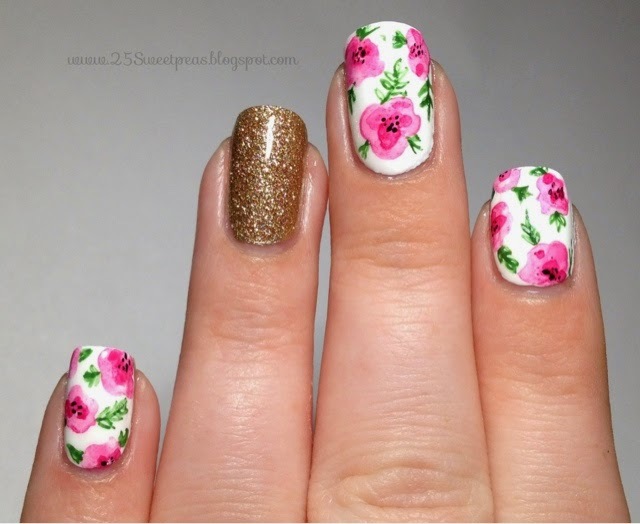 So the top left nails belong to Properly_Polished, the top right nails belong to AlondraLovesPolish. I just love them!! They are so fun!! Also if you aren't familiar with these girls you can click on their names above and it will take you to their Instagram! They both do lovely work all the time, I'm a huge fan! Well I hope you all enjoyed this post, let me know what you think of these nails below! Ughhh! I seriously love these nails so much! they're perfection! Aww, thank you soo much! <3 :) I really appreciate it! !